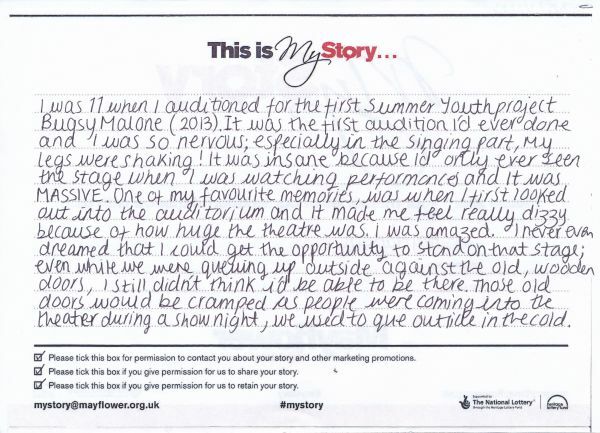 My Story card: Amy Marsden remembers performing in Bugsy Malone. I was 11 when I auditioned for the first Summer Youth Project Bugsy Malone (2013). It was the first audition I'd ever done and I was so nervous; especially in the singing part, my legs were shaking! It was insane because I'd only ever seen the stage when I was watching performances and it was MASSIVE. One of my favourite memories, was when I first looked out into the auditorium and it made me feel really dizzy beacuse of how huge the theatre was. I was amazed. I never even dreamed that I could get the opportunity to stand on that stage; even while we were queuing up outside against the old, wooden doors, I still didn't think I'd be able to be there. Those old doors would be cramped as people were coming into the theatre during a show night, we used to que outside in the cold.